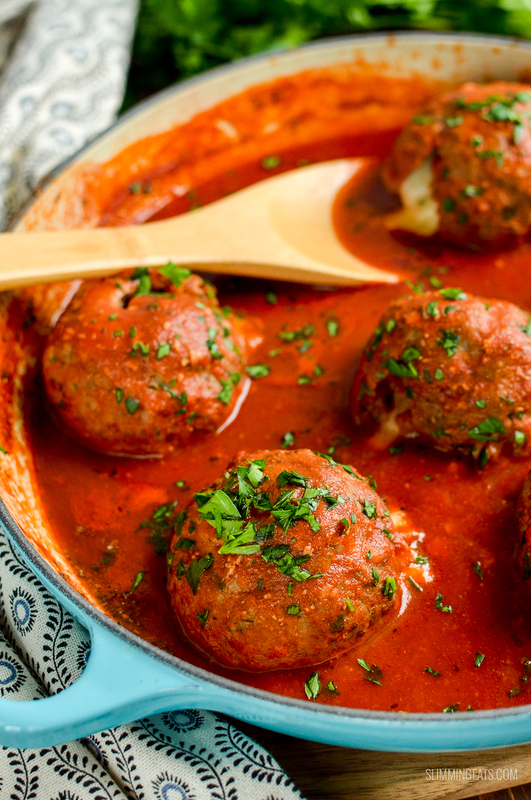 Amazing Mega Stuffed Meatballs with Tomato Sauce – delicious beef meatballs with oozy melted mozzarella, peppers and onion inside. If there is one thing I know I can make that the kids will devour with no complaints, then it is definitely these Mega Stuffed Meatballs. I’d even go so far as to say, they will devour a bowl of these, just as they are with no sides what so ever. Now that’s gotta be a sign of how good these are right? What’s not to love? Tender beef meatballs with the surprise of melted mozzarella and yummy sauteed peppers and onions for a perfect taste explosion. Pizza stuffed meatballs come to mind, whenever we dig into these, as it has all our favourite pizza ingredients, including the yummy tomato sauce because let’s face it, you can’t have meatballs without sauce. You might be wondering do I really need to add breadcrumbs? 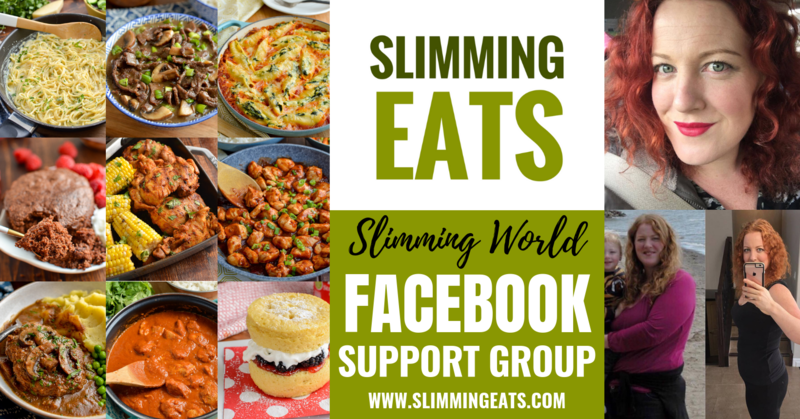 and really wanting to keep this syn free, but trust me when I say breadcrumbs make such a difference to meatballs or meatloaves for that matter, especially when the meat is very lean, it will keep you meatballs nice and tender and not dry. So I suppose you could leave them out, but in all honesty, why would you, it’s only ? syns per serving and totally worth it if you ask me. 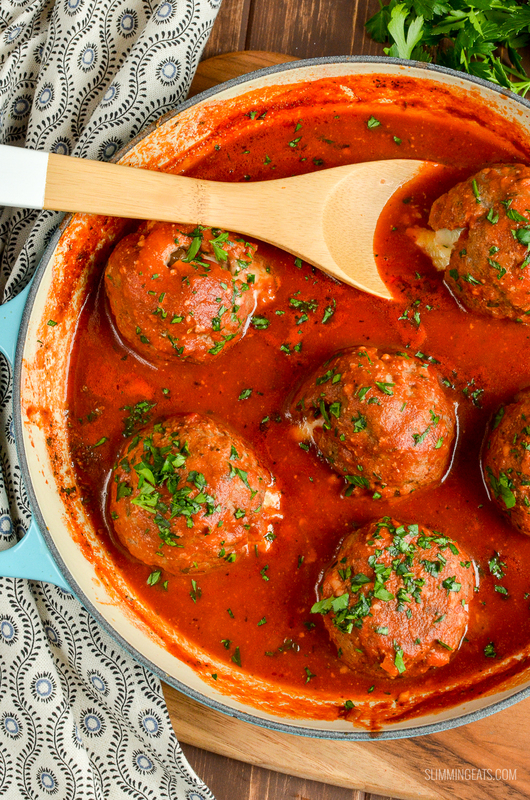 This recipe for these Mega Stuffed Meatballs with Tomato Sauce makes 6 large meatballs which is a 3 person serving, so if you want to make more just double up the recipe, they freeze perfectly too. I just fully defrosted and then reheat in the oven with the sauce or in the microwave. 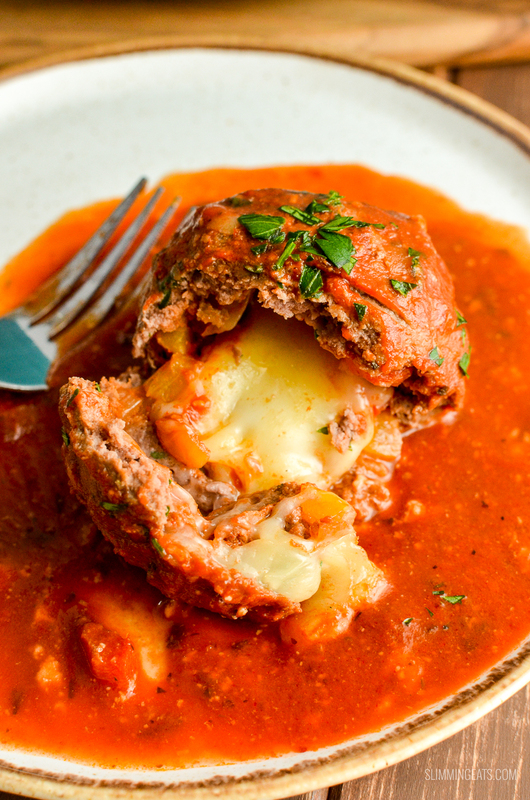 Just look at that delicious melted cheese inside this meatball, served over that amazing tomato sauce – yum!! 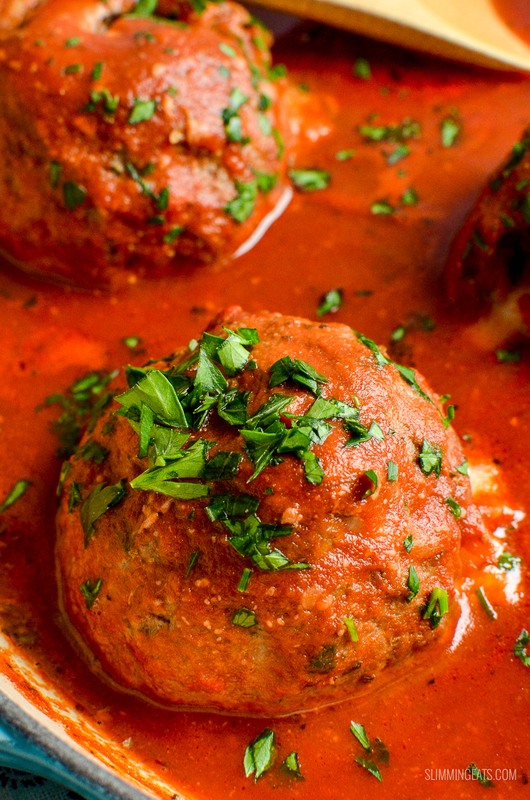 How can I add a 1/3 speed foods to these Mega Stuffed Meatballs with tomato sauce? There is already all the speed foods in the sauce as well as the peppers and onion inside those amazing meatballs. But for some additional vegetable options, these would be delicious with some spiralled zucchini/courgette using a vegetable spiralizer. 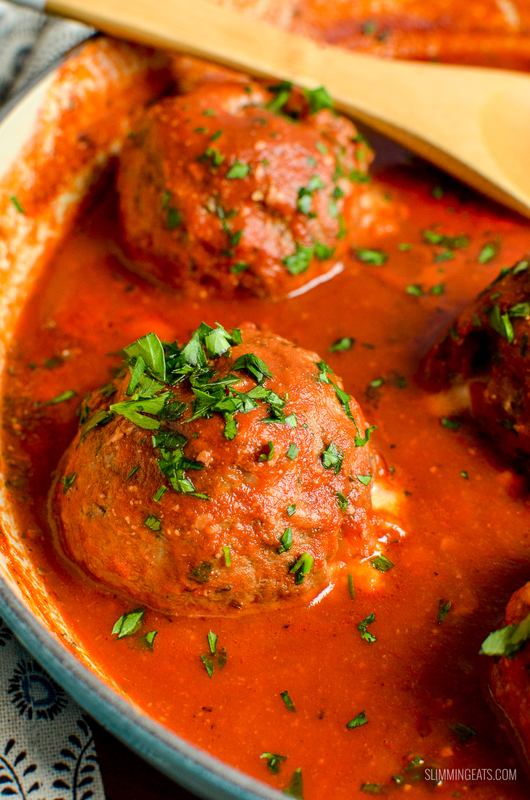 What Kitchen Items do I need to make these Mega Stuffed Meatballs with Tomato Sauce? 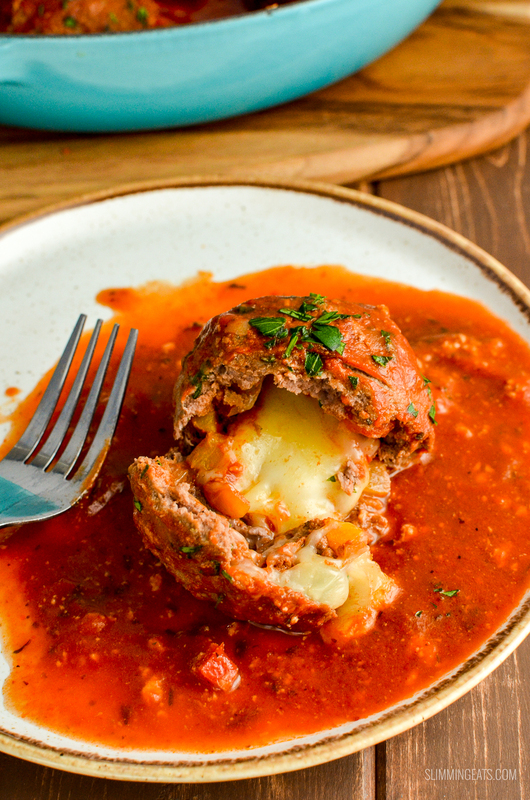 Amazing Mega Stuffed Meatballs with Tomato Sauce - delicious beef meatballs with oozy melted mozzarella, peppers and onion inside. Stir in the tomato paste and paprika and then gradually add stock from the 2/3 cup of stock and reduce down until the onions and peppers are softened. Divide the meatballs mixture into 6 equal sized pieces. Take one of the pieces and flatten into a pancake shape and them form up into a bowl. Add a spoonful of the tomato and pepper mixture and one chunk of mozzarella and close up the meat around the filling, making sure it is firmly closed to avoid any of the filling leaking out and then shape into meatball. Place on parchment paper on a baking tray. Repeat for the 5 other meatballs. You may have some pepper and tomato filling left over, but don't worry you can add this into the sauce. Place the meatballs in the oven and bake for about 15-20 minutes, until golden. Add in the crushed tomatoes, tomato paste, stock and balsamic vinegar and bring to a boil, then simmer on a medium high heat until it reduces down to a thicker tomato sauce. Sprinkle with some fresh chopped parsley. 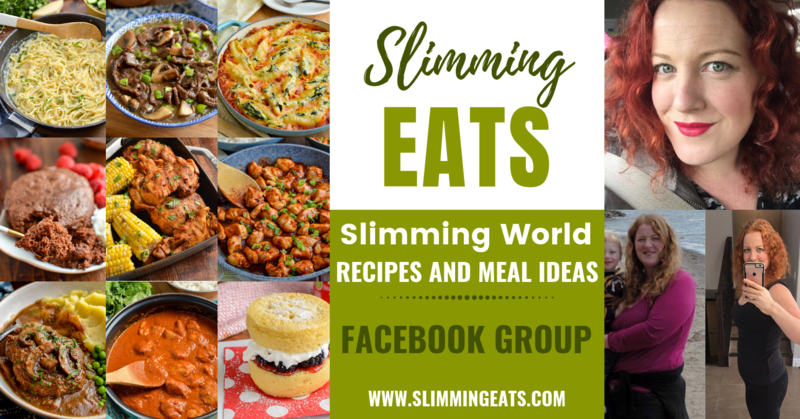 Hi – I’m looking forward to making these! What are Italian breadcrumbs….. I’m in the UK and not sure whether to use panko/fresh breadcrumbs/dried breadcrumbs? dried or fresh breadcrumbs should be fine (not panko). 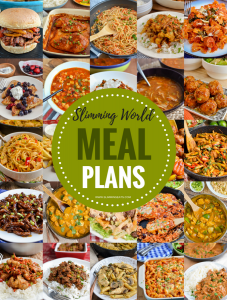 Just adjust syns to the ones you use as they may vary.